This chapter provides a basic template that governments can use when integrating budgetary information into any type of e-government website. Building on previous scholarship on citizen participation, budgeting, and budgetary transparency in e-government, the template divides budgetary information into two broad categories: process-based information that gives citizens a better understanding of budget decision-making and their avenues of participation, and outcome-based information that shows citizens the types of revenue collected by the government and how those revenues are used. We examine these two categories of budgetary information on state governmental websites in the United States and find that as governments increase the technological presentation of budgetary outcomes on their websites, a decline in the presentation of some types of budgetary process information occurs. We suggest that regardless of the sophistication of the e-government website, governments must present information on both the budgetary process and outcomes for true budgetary transparency via e-government to occur. If greater citizen participation can enhance democratic decision making, then enlarging the scope of participation by using technology to increase transparency should be a worthy aim of electronic government. Our chapter shows practitioners and scholars how to incorporate greater budget transparency into electronic government (or e-government) and why such fiscal transparency is necessary in a democracy. Over the last decade, most governments have steadily enhanced their e-government services from billboard-type websites that simply provide information to citizens to interactive portal systems, wherein citizens can search for and access different services and communicate with their elected officials (Garson, 2006; Ho, 2002; West, 2005). While it is debatable whether this progression will continue into some type of interactive, online citizen democracy (Coursey & Norris, 2008), what is not debatable is that most government websites have continuously increased in sophistication since the 1990s. Today, most governments offer more information and more services on their e-government websites. 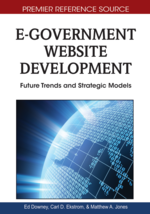 While the trend toward greater website development and use accelerates, budgetary information on many governmental websites has not shown a similar pattern of evolution. A cursory glance at most budget homepages shows that governments typically display budget data in large portable document formats (PDFs) that are often hard to understand and difficult to download. Even when governments try to enhance their budget homepages by utilizing newer technologies to create searchable online budgetary database systems for citizens, the information is still often hard to search through and difficult for citizens to understand. This is unfortunate since the budget is one of the most important public documents for citizen engagement. It directly communicates to the public how their government collects revenue and where those revenues are allocated and eventually spent. It showcases historical spending, the political priorities of the day, and planned spending and anticipated income for the near future. By making budget information more accessible on e-government websites, citizens can hold their policymakers accountable for budgetary decisions. With more of this type of accountability, governments can make more responsive budgeting decisions (Benito & Bastida, 2009). In this chapter, we provide a basic template that governments can follow when posting budget information to any type of budget website; from basic “billboard” websites that just display information to interactive online databases. Our template emphasizes budget transparency by emphasizing the budget process and budgetary outcomes. Making this information transparent to citizens is important since it increases accountability over the budget and encourages meaningful citizen participation in the budget process beyond simply informing them of budgetary timetables and actions (Berner, 2001). In addition, we provide a brief analysis of state governmental websites to assess their effectiveness in regards to budget transparency. Our results indicate that some aspects of budget transparency become minimized as budget websites increase in complexity from a basic billboard website to an interactive online database. Thus, this chapter has three primary objectives: (1) to link budget transparency to e-government and show how that link enhances citizen participation in a democracy, (2) to assess the state of budget transparency on e-government websites of American state governments, and (3) to develop a simple template that all governments can follow, regardless of website sophistication, to help ensure budget transparency on their e-government websites.